It comes as no surprise that just over a year after Tiffany Haddish was welcomed into Hollywood with more enthusiasm than anyone since J-Law six years ago that she would be headlining a comedy with Kevin Hart set to premiere in the typically dry time between the summer movie season and awards season where it will undoubtedly make all the money. Night School, an out and out comedy about a group of troublemakers, including Hart's character, who are forced to attend night school in hopes of obtaining their GEDs, pits Hart as a successful business owner who has nowhere to turn after he loses said business in an accidental fire against Haddish. This will seemingly build a love/hate relationship with Hart's student as he was hoping to skate by in acquiring the few credits he was missing for his GED while Haddish's character, well, it's kind of unclear where she falls at the moment as she is initially indifferent towards the night school gig, but as a full-time teacher seems to have a fun rapport with everyone else at the school including Taran Killam's principal who defaults to using "black voice" when in the company of Hart and Haddish. It's a funny running gag in the trailer and I'm curious as to whether this will come out as PG-13 or R as I would have assumed it to be the latter, but this first look gives the impression Universal might prefer to play it safe and capitalize off the pairing of its two stars with as wide an audience as possible. Girls Trip director Malcolm D. Lee (who also made both Best Man films) is at the helm here as well and while his full filmography would suggest a spotty track record his most recent works including Best Man Holiday, the third Barbershop film, and last summer's massive aforementioned comedy that made Haddish a household name have leaned toward the better end of the spectrum than the other. While Lee's latest certainly doesn't look like anything that will break the mold it definitely has the components and credentials to make me excited at the prospect of it. 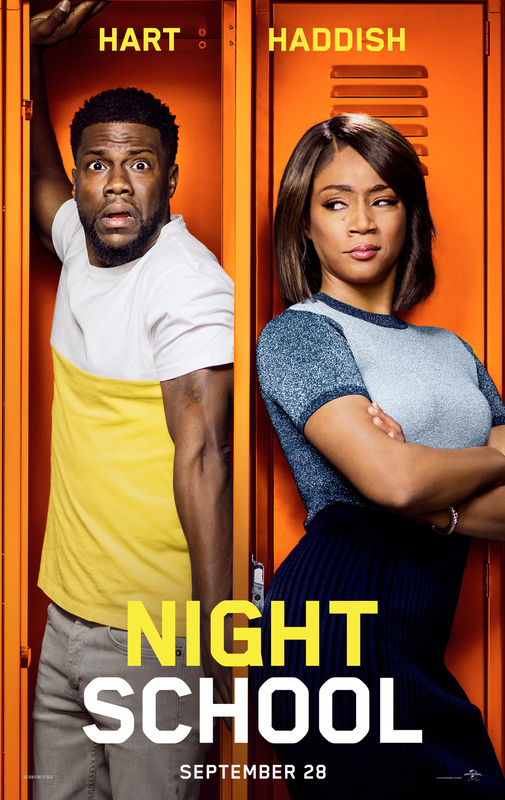 Night School also stars Ben Schwartz, Rob Riggle, Keith David, Mary Lynn Rajskub, Anne Winters, Jacob Batalon, Mason Guccione and Romany Malco and opens in theaters on September 28th.